This page is a work in progress. Please send feedback to tom.moran@ahcusa.org. The following set of instructions will provide information that will guide you through the process of logging onto the Regional Secure Information Sharing Portal (e.g. 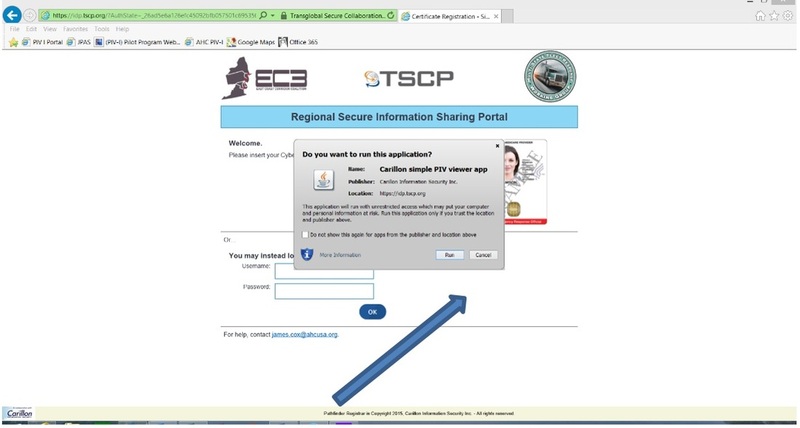 the Portal) using your PIV-I Credentials. These instructions will cover the setup, testing and usage of your equipment (e.g. 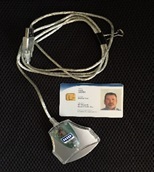 your PIV-I credential/card and card reader, your computer or tablet with USB port, your Internet connection, and your browser (use Internet Explorer for now). You will need the following equipment in order to access the portal. 3. Computer (running Windows 7/8) or tablet with USB port and access to the internet via Internet Explorer. NOTE: Apple/Safari, Mozilla/Firefox and Google/Chrome do not work at this time. Please follow these instructions to test your PIV-I credential and equipment. 1. Set up, turn on and access your computers web browser ensuring that you have a connection to the internet. 2. Secure your card reader and PIV-I card, plugging the card reader into a USB port on your computer/tablet. 3. Insert your PIV-I card into the card reader and ensure it has been read, generally indicated by a light on the card reader. NOTE: It is assumed that your are using Microsoft's Internet Explorer as your web browser for now. 5. You will be taken to a webpage where the portal will ask for permission to access and upload your card certificates, select run on the pop up window for the Carrillon Simple PIV viewer app. This app will allow the portal to automatically read and upload your identity data on your smartcard to verify your identity before you are allowed into the portal in the future. 6. A pop-window will appear shortly after your arrive on this webpage saying "Do you want to run this application? Click the RUN button and the app will install. 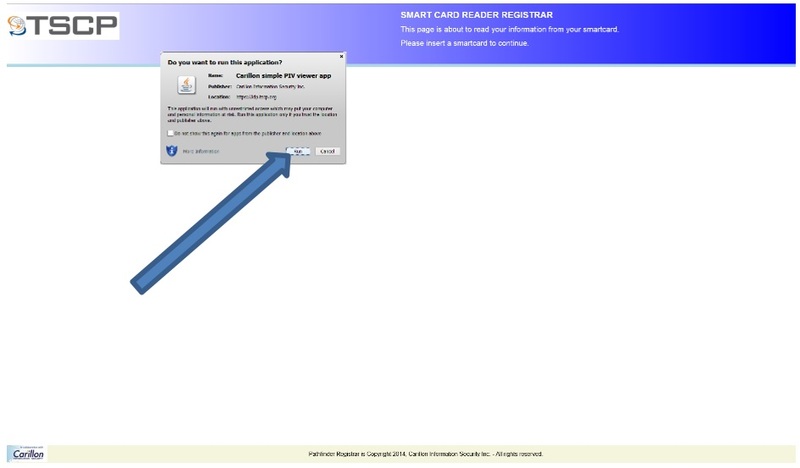 "This page is about to read your information from your smartcard. Please insert a smartcard to continue." Insert your smartcard into your card reader at this time (if it is not already inserted). Your card information will be read and you will be routed to the next screen. "An unexpected error occurred in the applet." No worries. It just means the screen has timed out while waiting for your smartcard info to be read. Just click on the RELOAD button it the site will refresh and read your card if it is inserted into your card reader properly. 8. 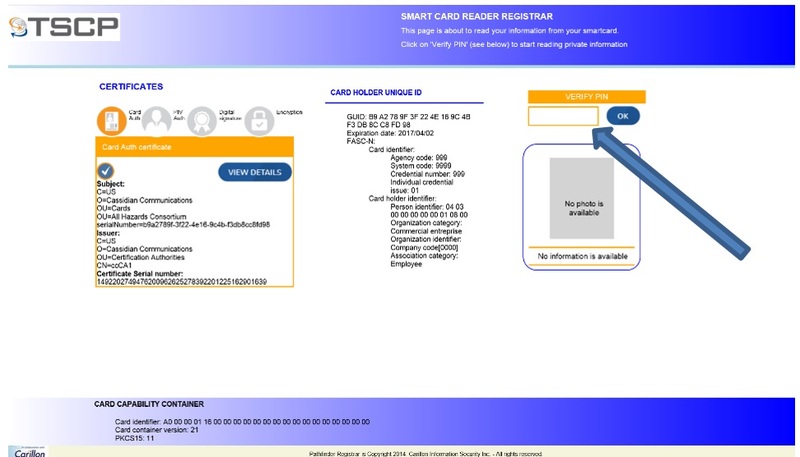 In the next screen after successful upload of your certificates the program will ask you to enter the pin number associated with your smartcard to complete the verification and allow access to the portal. Enter your PIN number and click on the OK button. 9. Once you enter your PIN, the screen will populate with your picture and all of the data read from your card. You PIV-I card and equipment have now been tested and you are ready to access the Fleet Response Working Group's Regional Secure Information Sharing Portal as soon as it comes online. 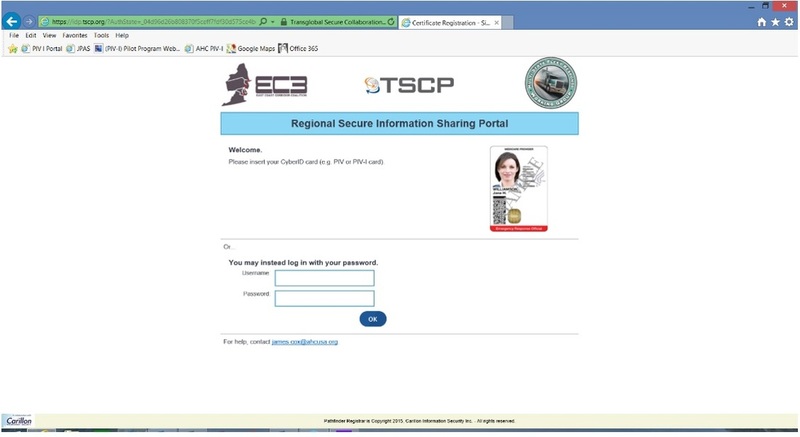 Please follow these instructions to access the RSISP (Regional Secure Information Sharing Portal) Portal using your PIV-I credentials. 1. Set up your equipment as outlined in Step 1 above. link: http://www.java.com/en/download/installed.jsp. This steps is detailed below on Troubleshooting section. 4. Plug in your card reader into your USB port on your computer/tablet. 5. Select the following link which will take you to the RSISP Portal, see picture below. If for some reason your browser asks you to install or update Java see troubleshooting below. 6. Insert your PIV-I card in the card reader and the pop up window below will display and will ask for permission to access and read your card certificates, select RUN on the pop up window for the Carrillon Simple PIV viewer app to proceed. 7. In the next screen the program will ask you to enter the pin number associated with your smartcard to complete the verification and allow your credentials to be verified. 8. Upon successful completion of these steps you will be touted to the home screen and be able to view the portal and access information based on your current level of access. Below is the screen that you should see when reaching this step in the process. If for some reason you cannot get the smartcard to work, you will need to contact the smartcard issuer. In the case of cards issued by the AHC the first point of contact is the Angie Wanger, angie.wanger@ahcusa.org Cell 240-285-3276 who will assist or direct you where to find assistance. If the card was issued by your agency or company, please contact them or the the card provider for assistance. Along with the smart card you were required to enter a unique pin#, if for some reason you cannot recall that number or are locked out you will have to contact the car issuer. IMPORTANT: After 10 failed attempts to login, you will be locked out and will need to reset the pin on your PIV-I card. In the case of the smartcards issued by the AHC you will have to visit the card issuance facility in Herndon VA to have that pin number reset. a. Remove your smart card from the reader. b. Using the up arrow on the lower task bar of your computer screen, select the device and select eject to unplug the device. c. Unplug the device, wait 1 minute and then plug the device back into a different USB port. d. Replace your smart card in the card reader properly and attempt to gain access again. a. Ensure you have the correct web address, see above instructions for the link. issue with your own personally owned devices. f. If you still cannot access the website, please contact the Angie Wanger, angie.wanger@ahcusa.org Cell 240-285-3276 for support. If you are asked to update or install Java on your Windows computer (a software application needed to access the portal) please use the following link below to active and/or install JAVA on your computer. 1) Active JAVA already installed on your computer or.. This may require administrative rights to access to your computer.